Eric has a wide range of experiences of ADAS/AV in both technology and business strategy. At Ford Motor Company, Eric worked on all three key domains of AV: Autonomous Vehicle Platform, Virtual Driver System and Transportation as a Service, where he contributes to architecture, design and implementation of safety-critical features and functions that are fundamental to SAE L4/L5 level autonomous driving and profitable commercialization. At ZF, Eric was the technical lead of electric-power steering for GM CT6 program and its super-cruise features. Currently, Eric is part of the Global Product Planning and Strategy group at Ford Motor Company where he is responsible for corporate product strategies in next-gen E/E architecture, IVI, etc, in response to disruptive trends in autonomy, electrification and connectivity. Eric understands what it takes to build a successful AV program from both technical and business perspective. 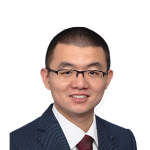 He is also uniquely positioned to offer advice in business developments, partnership opportunities between US and China in ADAS/AV. Eric holds Master of Science degree in Electrical Engineering from New York University and MBA from Stephen M. Ross School of Business at University of Michigan. He has served on industry organizations including secretary of SAE Chassis Controls Technical Committee, SAE Active Safety Systems Standards Committee, etc. He has over 10 patents in the domain of autonomous vehicles.